From the Book Jacket: This is a story of a very special rabbit. He enjoys doing rabbity things, but he also loves - well, un-rabbity things. His boundless creative talent is a source of joy and inspiration to the other rabbits. When Rabbit suddenly disappears, no one knows where he has gone. His friends are desolate. But, as it turns out, Rabbit has left behind some very special gifts for them, to help them discover their own unrabbity talents. Rabbityness positively introduces children to dealing with a loss of any kind. Why It's On My Bookshelf: Sometimes I get requests from parents or teachers for books dealing with very specific grief situations. If I can't find the perfect fit from my bookshelf I definitely feel frustrated. 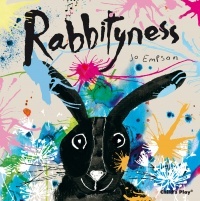 Rabbityness is a really special story I can use to cover a lot of different grief or tragedy situations. Rabbit disappears in the story - but no one knows why or what happened to him. I like that there's no answer as to what happened because I can help the child relate their own story to Rabbit. "One day. Rabbit disappeared. The other rabbits were very sad. They couldn't find him anywhere. The woods were quiet and gray. All that Rabbit had left was a hole...a DEEP dark hole." Absolutely love this one and see it HELPING me as a counselor and the grieving children I work with throughout the year.